Ashtanga Vinyasa Krama Yoga and Beyond...at home : No longer identifying as an Ashtangi..... or a 'yogi' for that matter. No longer identifying as an Ashtangi..... or a 'yogi' for that matter. I saw this expression recently 'I no longer identify as...', it's not ideal perhaps but it struck a chord, it seemed a convenient way to encapsulate my thinking (feeling?) of late and certainly as a conceit in trying to write this difficult post. "I no longer identify as an Ashtangi". Update: Somebody just commented "Who cares". They make a good point, but after eleven years of daily practice and ten of writing about it, feeling that I (and I'm assuming I'm no alone) no longer want to be identified with this practice.... well, I care, clearly. can't help wanting to make the most of it. Identifying as anything is probably not a good idea in the first place but it's easily done and more often than not just convenient, especially when writing a blog. From early on I seemed to have identified my daily practice as Ashtanga, and as we so often end up fitting our life around our practice we end up identifying ourselves by said practice. I don't think I ever identified as 'a yogi' however. Those who run each morning, whose diet changes on account of their running, who go to bed early because they know they will be getting up early the next morning to run, who become fascinated by the technique of running and read all they can as well as at some point any anatomy that relates to the occasional aches and pains they develop. They no doubt end up with friends with similar interests, the only people perhaps who can understand a commitment to a practice that seems to feed into all areas of their lives. They too no doubt often identify themselves with their practice, as 'a runner'. Though I didn't perhaps follow the expected or indicated path of practicing at shalas and going to Mysore, preferring to practice at home alone, I still seem to have ended up identifying myself as an Ashtangi, a home Ashtangi perhaps but an Ashtangi all the same. As the years went on and I explored and practiced with Ramaswami and looked more deeply into that which Krishnamacharya shared with him, I still considered my practice Ashtanga. My Vinyasa Krama would fall naturally into the shape and format of the Ashtanga practice I was most familiar with. Likewise, when I went back to Krishnamacharya's own early Mysore texts and practiced for a couple of years as he indicated in his texts it was still, in my mind, Ashtanga. We could see the table of asana in Krishnamacharya's Yogasanagalu (Mysore 1941) that, with minor modification, became Jois' presentation of his teacher's practice, it was all essentially Krishnamacharya's practice, somewhat simplified perhaps in Jois but essentially the same, the philosophy was the same, the goal supposedly the same. This year I have moved further away from straight ashtanga than ever before. I would start my practice with some of Simon Borg-Olivier's spinal movements, do a few standing postures then four or five seated asana before moving into shoulder stand and headstand sequences (Note: Jois indicated in Yoga Mala that we would/could/should adapt our practice after reaching 50). Most Ashtangi's wouldn't perhaps have recognised it as Ashtanga but to my mind it was still essentially Ashtanga. If I had thought about it I probably still identified as 'an Ashtangi'. A month ago I stopped practicing asana, Simon Borg-Olivier's Spinal movements no longer led into standing and seated asana but into other Qigong sets and exercises, the sets came together into a practice. 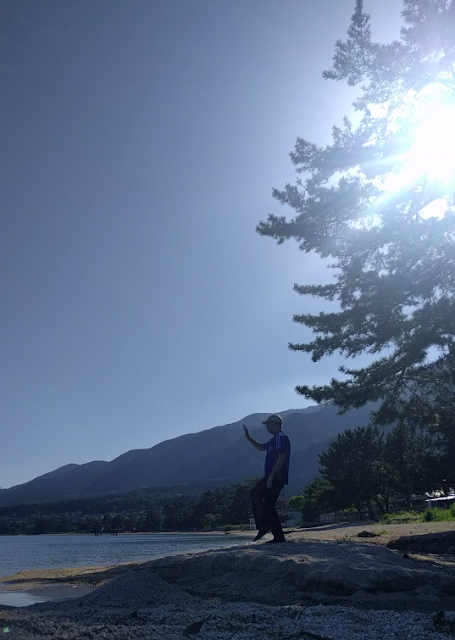 I liked that I could do my whole practice standing up and that I could stroll down to the lake and practice beside it, just as I was, without a mat or thinking too much about what I happened to be wearing. I liked that I wasn't binding, laying on my back, standing on my head. I liked that I could do my meditation practice standing as well as my active practice. I liked how my practice became somewhat more of a part of the nature I have surrounded myself with here ,between the lake and the mountains. I liked the way my body felt, alive from toe to crown, energised rather than physically tired. Ashtangi's will often tend to suggest that those who leave Ashtanga couldn't handle the boredom or the physicality of the practice. I can honestly say that I don't remember a single practice in which I felt the slightest bit bored. I loved the physicality of the practice too. In the early days, the sweat and exhaustion was exhilarating but latter too when I would practice more slowly with calmer, slower breathing in a cooler room I loved the physicality of that too. I still believe Ashtanga is a delightful practice. Practiced well, mindfully, humbly...., modestly it can be a wonderful way to build discipline and focus, especially if these are something one has always struggled with. The naysayers of Ashtanga often have an extreme form of how it is occasionally, unfortunately, taught and practiced. Taught and practiced mindfully it's fine. Well you know why or can perhaps guess. I have written here that all that has gone on concerning Pattabhi Jois' historic sexual abuse need not concern our practice and I still stand by that. Besides, Krishnamacharya has been more of a focus for me in my practice than Pattabhi Jois. Not going to a Shala daily, not practicing regularly with a teacher who practiced with Jois directly. Not going to Mysore, the Jois family has been of less concern or interest than it might have been. I did though go to Manju to try and get an idea of how Jois taught his son before the western students came, to try and get as close to Jois' time with Krishnamacharya as I could. I went back to Manju though because I loved him not because of whose son he was. Sharath has always been somewhat of a disappointment from afar. His was always a difficult gig, taking over from his grandfather as he chose to do, but if the Paramaguru title wasn't the last straw for me then his treatment of others during the teacher's list debacle certainly was. Perhaps if I had practiced with him directly I would be more.... tolerant, kinder. Jois' abuse is in the past, or at least it is for those of us who luckily never suffered it directly, but the response to that abuse is of the present. It is NOW. Still people turn away, make excuses, dismiss or vilify those brave enough to speak up at last. Some of my own friends and loved ones still post photos of a smiling Jois while those who can't hep but re-live aspects of the trauma they experienced through speaking up are revealing their scars. Videos that include, as we can clearly see now, Jois abusing others, not as explicitly perhaps as in some other videos but still there to see, are still being pointedly shared on social media. I find it shameful and have quite frankly wanted nothing to do with the practice or community, wash my hands on the whole thing. Nobody is damaging Jois' reputation, he did that himself through his behaviour. We heard testimony but didn't listen. Finally one of the most widely respected teacher in our community spoke up. We heard reports that Sharath and Saraswati saw the abuse themselves and tried to stop it. We read more direct testimony from those who were also abused. We heard from other respected teachers what they had themselves seen, we heard the shame they expressed in not speaking up, in not doing more. We read a brief apology, later disappointingly deleted, from Jois' own Son. And still there are those making excuses, looking the other way, vilifying, and STILL posting smiling photos of Jois along with videos of his abusive teaching. It's not the past that made me want to unidentify myself with Ashtanga, it is the present. Kino/Alo/Cody is just one more disappointing sideshow. I didn't intend to write so strongly, triggers. And yet M. still practices her Primary, there beside my Qigong on the weekend. And I stumble upon photos and videos of Ashtangi's practicing, photos and videos that are about the practice itself rather than about them personally, unlike so many other photos and videos on social media. I choose to believe that most have a sincere relationship with the practice, that it's not about looking good though perhaps feeling good, that it's about the work, the discipline and focus, that there is a sincerity in this practice. I know that there several teachers who seek fame, recognition, monetary rewards but again, I choose to believe that most teachers are rarely heard about outside their own circle and put themselves there at the service of their students. Many may perhaps be too strongly influenced by Sharath and have a heavy hand in their teaching but the hope is that the more they teach the lighter their hand will become. It was for this reason, this more hopeful feeling and resilient fondness for the practice that I brought my Manduka back out of the cupboard and practiced Primary along with M. on Saturday and am planning to practice once a week beside her. And it was a delightful practice. I was surprised that I could still bind Marichi D and Supta kurmasana, Qigong seems to be maintaining some flexibility at least. However, if Ashtanga is often thought to be about upper body strength then qigong is about the legs, I'd lost a lot of strength in my shoulders and across my chest, chaturanga and upward facing dog were killing me by the end of the practice. I also found my hamstrings were a lot tighter and I had almost lost Urdhva Dhanurasana altogether. At the end, after a little pranayama and a short Sit, I was reminded why I fell in love with this practice in the first place. Will I go back to it? Perhaps one day if/when I lose this taste in my mouth. I notice that I'm coming up to ten years blogging about Ashtanga, July 9th 2008 was my first post, it was on Jumping back when this blog was still called Ashtanga Jump back.... at Home.